Summary of today’s show: Fr. Mark shared with Scot his own vocation story, which called the most boring we’ve heard, as well as the reasons why he pronounces “out” funny and how he came to be a canon lawyer. Scot and Fr. Mark then reflected on the first 100 episodes of the show, how Scot came to be host, and his own time as a seminarian before becoming a husband and father. Finally, a reflection on thisSunday’s Mass readings. 1st segment: Scot told Fr. Mark that today is his last week on theshow for the next two weeks while he’s on vacation. 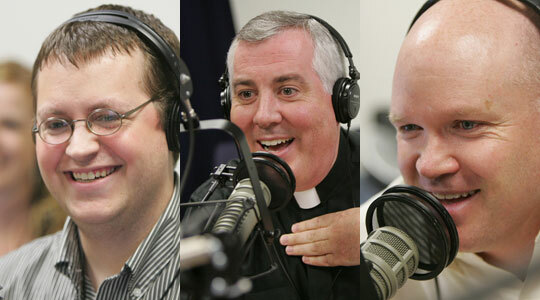 We have taped shows for the next 10 shows, including Artie Boyle talking about Medjurgorje; Fr. Andrew Apostoli, CFR, on Fatima; Fr. Roger Landry on Catholic Marian beliefs; Fr. Peter Loro from South Sudan; Jim and Terry Orcutt from My Brother’s Keeper; and some more. There will be a live news show next Thursday. Scot wished a happy birthday to Sr. Olga Yaqob, who is founding a new religious order in the Archdiocese at the request of Cardinal Seán. Fr. Mark said this Monday he will be participating in the golf tournament at St. John’s Seminary. He wasn’t going to go, but Kathleen Heck at the seminary sent him a personalized top-10 list of reasons why he should go. Look for more information on the tournament at St. John’s Seminary’s website. Scot said it’s inspiring to see prioests out and having fun in an event that really provides good support to the seminary. 2nd segment: Scot asked Fr. Mark about growing up in Toronto, Canada, until he was 12. His father is from St. Mark’s Parish in Dorchester and his mother is from St. Theresa’s parish in Watertown. His father was a university librarian and he was head of research at Widener Library at Harvard, the second-largest library in the US. That’s where his father met his mother when she was working for a professor and he sent her to the library to get a book. There was a brand-new university in Toronto called York University. His father was offered a job and went to create a brand-new library from scratch. That library now has more than 1 million books. Fr. Mark was born there and grew up playing hockey. He moved to the US on July 4, 1976. They moved to Dover where he attended high school and then he attended Boston College, where his father had become the college’s librarian. His father created the Thomas P. O’Neill Library and then the Burns Special Collection library at Boston College. On his eighteenth birthday, he was sitting on the porch in the back yard of his parents’ house and thinking that he had no idea what to do with his life. He had a thought that if he could do anything, he’d like to be a priest. Fr. Mark’s uncle was a priest and his father’s uncle was a priest too, and they were happy priests and a good example of the priesthood. He had the thought that he’d like to be a priest and wanted to God call him, then thought that maybe this is the call. So he decided to live his life as if he was called. In his years at St. John Seminary, he had no doubts that he was going to be a priest and has never doubted since then. An altar boy once asked him, if he could be something other than a priest what would he be. Fr. Mark said that he couldn’t be anything else because being a priest is his identity. It is who he was created to be. After ordination 21 years ago, he was first assigned to St. Barbara’s in Woburn for five years with Fr. Vin Malone who is still pastor there. He served at St. Mary in Danvers and Salem State College. Bishop William Murphy, then the vicar general, asked him to make an appointment to see him and Fr. Mark thought he was in trouble. It turned out that the the bishop wanted him to attend school to become a canon lawyer. He was asked to attend Santa Croce Seminary in Rome. Scot asked him why he thought he was chosen, and he thought it was because he was loyal and open and willing to work for the Church. The hardest part was that all the classes were in Italian with a Spanish accent and grammar because all the teachers were from Spain. Despite studying Italian for the summer, his first class he understood only two words: Molto importante. Very important. There was another student in the class named Jim Snow, who took his notes in English. So for the first month that’s how he got by in class. Suddenly in one class, he understood. He eventually defended his doctoral dissertation in Italian. The dissertation was written on one paragraph of one canon out of 1752 canons. He’d been advised to make the subject as narrow as possible. After coming back to Rome, he spent 7 years as the assistant to the moderator of the curia for canonical affairs. He worked in the old chancery in Brighton and Bishop Murphy was his boss. He served under Bishop Edyvean, Bishop Lennon, and then Father Erickson before moving to the tribunal. He spent a lot of his time on the abuse crisis and closing parishes in addition to the usual tasks of dispensations and reviewing books for imprimaturs. Those 7 years were perhaps the most difficult 7 years in the history of the Archdiocese. He always tried to be part of the solution and not part of the problem. He and Fr. Robert Kickham are the only two left in the pastoral center who were here throughout those events and they provide the institutional memory. In 2007, he became judicial vicar running the metropolitan tribunal. He also teaches canon law at the seminary and is vice-chancellor. He’s also chaplain of the Catholic lawyers’ guild and liturgical master of ceremonies for Bishop Walter Edyvean. The Catholic Lawyers Guild goes back 800 years in Catholic history and they sponsor the annual Red Mass for the opening of the judicial year every year. They are Catholic judges and lawyers who network together and try to nourish their faith in the midst of this very interesting Commonwealth of Massachusetts. He’s served Bishop Edyvean as master of ceremonies for 10 years and counts him as a close friend. 3rd segment: The idea for The Good Catholic Life came from Cardinal Seán after the inaugural Mass for WQOM on November 1, 2010. He said it would be great to have a local show. Scot started talking with Jim Wright, owner of The Station of the Cross network. At first, Jim wasn’t so sure about it because so often local shows are the equivalent of local cable access, but he remained open to the idea. Over the next several weeks, they continued to talk about it. Scot had a background in college working on sports radio. Fr. Mark said Scot has an ability to talk about anything. He recalled one show where Fr. Phelan of Holy Cross Family Ministries and when the remote feed dropped, Scot picked up from there, but Fr. Mark was paying attention to what producer Rick Heil was doing and when Scot threw it to Fr. Mark, he had to admit he wasn’t listening. Scot said live radio is exhilarating. He’s also learned so much about our faith in the 115 hours of radio that we’ve recorded. Scot spends several hours before each show preparing and that’s helped him to learn so much more about the local Church. There have been 135 guests including 45 priests and bishops and a handful of religious sisters. He noted inspiring stories of My Brother’s Keeper in Brockton and Easton or Cor Unum Meal Center in Lawrence or the dozens of inspiring vocation stories of priests and religious. He realizes that God has called each of us in unique ways. He’s learned so much more about many ministries, now knowing more than just their name. Fr. Mark said going over the Sunday reading is appreciated by the listeners to go over the readings before the Sunday Mass. He noted that Scot was a seminarian once and he has a gift of preaching. Scot said he entered the seminary acknowledging a 50/50 chance of having an authentic call to the priesthood and being generous to God with his life. Fr. Mark noted that Scot and his brother Fr. Roger were featured in a book about seminarians at the Pontifical North American College. An Associated Press reporter who had worked in Rome for many years but wasn’t Catholic wanted to find out more about so many “normal” guys giving up careers and entering the priesthood. It included profiles of six men in their first year at the seminary. Scot said it made them somewhat one-dimensional, but it’s still a good read. Fr. Mark said he read the book before he went to Rome and Scot said many of the seminarians there have read the book before going to the college. Scot said living in Rome is phenomenal experience of the Church. Fr. Mark said it is interesting how God called Scot instead to marriage and family and ultimately to serving the Church. from the love of God in Christ Jesus our Lord. he withdrew in a boat to a deserted place by himself. The crowds heard of this and followed him on foot from their towns. his heart was moved with pity for them, and he cured their sick. and he ordered the crowds to sit down on the grass. who in turn gave them to the crowds. not counting women and children. Scot said for the first time in several weeks we don’t have a parable, but instead Jesus performing one of his most powerful miracles for perhaps 12,000 to 15,000 people. How phenomenal it must have been for them to be there. But it starts with Jesus hearing of the death of his cousin John the Baptist. How sad he must have been, but how caring he must have been to see those who hungered not just for food but for him. Fr. Mark said to notice that Jesus is disturbed in that deserted place, so he heals them and cares for them./ Afterward, Jesus goes back to the deserted place. That’s a lesson for all the busy people who have a hard time to find that deserted place to pray. For mothers and fathers, it can be difficult to find a quiet place to pray uninterrupted or for busy working people. Jesus shows us how not to let the distraction that is good to prevent us from going back to prayer every time. Scot notes that Jesus could have created food from nothing. But he used the meager gifts of the multitude to create abundance to feed them all. It’s easy to feel inadequate to say that it’s all on me, but we turn to God and say all things are possible in Him. We bring what we have and God makes it happen. St. Peter doesn’t meet the job description for the best possible pope, but God uses what we have and multiplies it. Fr. Mark noted that Fr. Paul O’Brien saw a huge need in Lawrence and created the Cor Unum program that feeds huge numbers of people every day. Fr. Paul didn’t do it himself, but he offered what little they had and God multiplied it. Not only have they served 600,000 meals, but other dioceses have come to see it as a model for what they could do in their dioceses. Think of the five people who only had a loaf of bread for themselves to eat, but they gave it up in faith to Jesus for their friends and neighbors. Fr. Mark in all 102 shows, we have so many people who did the same thing, saying I can offer this and let God make something beautiful with it. From the first reading, an ancient symbol of God’s love is the fountain and God’s love is like the water that is everlasting and always flowing.